The press days for the 2019 Detroit Auto Show have wrapped up, and now we will never again need to fly out to the frozen wastes of Detroit in January for a car show. Detroit is lovely in June! And we’ll be back for the first summer North American International Auto Show next year. Until then, here’s some of the things you didn’t see yet from around the show floor. Sorry, this isn’t a behind-the-scenes look at how they organize an event like the Detroit Auto Show. It’s just some of the interesting stuff we captured while walking around the show Monday and Tuesday, and a look at what most publications probably aren’t ever going to post. We did the same thing last year, too. Starting off just as we did back in 2018, we’ve got somebody laying on the floor looking under a car. This time it’s Jalopnik’s own David Tracy doing some hands-on research comparing the new Toyota Supra to the new BMW Z4 and 3 Series. Then, later on Monday, Toyota decided to move the red Supra from its presentation stage over the main floor, and they brought out the ramps. The other big car reveal of the show was the new Ford Mustang Shelby GT500. Bill Ford was there, one of the display stands for the new 7-speed dual-clutch transmission misspelled the company Tremec as “Tremac,” and Jason and Patrick got real weird in a walk around of the car. Former Jalopnik intern and serial tweeter Mack Hogan was also at the show for his other gig at CNBC, and there’s my newly bespectacled face patiently receiving his bad car opinions. 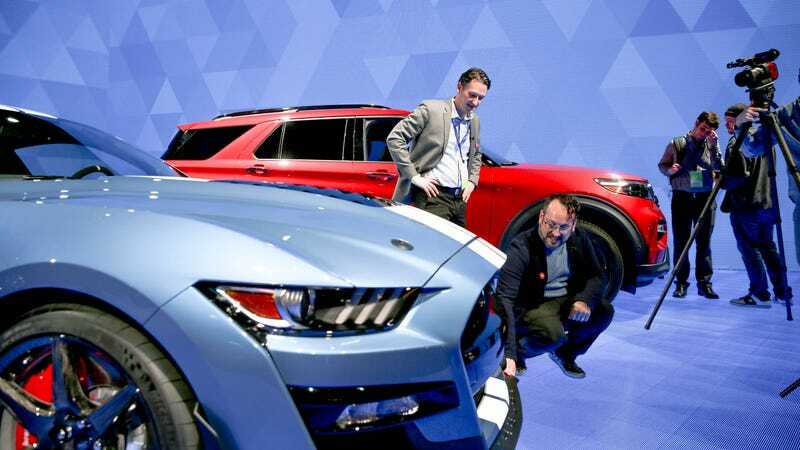 Ford’s misspelling of the company making its transmission aside, the biggest automaker whoopsie of the show was Infiniti’s new electric crossover concept struggling to drive out onto the stage during its presentation. After some mysterious fidgets behind the curtain and a few hours later and they finally got it to roll out. While all of this went down, I spotted Johan de Nysschen, the guy recently dropped as Cadillac CEO, which is where he went after leaving his position as Infiniti CEO a few years ago, on the Infiniti stage. I guess he was just checking in on an old friend. The rest of the photos are really just a random assortment of the types of things you often see at an auto show, like a guy recording voiceover up against a wall in the media room, a very silly jacket, and some other random stuff. Enjoy.